Nothing quite says "spring" like beautiful flowers. Whether you see the lovely pastel bouquets held by brides at spring weddings or that promising bud on a floral bush, the spring season really is about welcoming those May flowers. You can make beautiful flowers out of paper to say hello to the spring season. Create unbelievably gorgeous paper crafts for your loved ones! 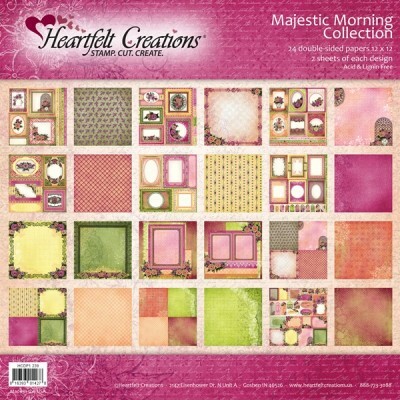 The Majestic Morning Collection from Heartfelt Creations is the perfect paper collection to craft with during the spring months. Use the coordinating stamps and dies along with the theme paper to start scrapbooking, card making, and paper crafting for the warmer months. Welcome spring with your very own DIY paper flowers when you craft with this collection. Short of your die cut system, this collection has everything you need to make a variety of beautiful paper flowers. The coordinating stamps and dies are perfect for creating the flower images and layering them together to create a dimensional new embellishment. Use the other background stamps such as the Majestic Collage Precut Set to create a gorgeous base image for a handmade card or scrapbook layout. Then, add your dimensional floral embellishments to make the image really pop! This collection is ideal for adding layers and layers of beautiful flowers to your paper crafts that will make them eye catching and, of course, majestic. As the perfect paper crafting collection for spring, the Majestic Morning Collection will amaze and inspire you. With a lovely color palette for the paper and a beautiful array of stamps and dies, this collection is a must-have tool for your seasonal paper crafting.